I was 17 years old when I reported for duty aboard USS Nautilus in 1959. John Krawczyk was one of the first men I met. He was always a gentleman and he was very helpful to me. I will always have fond memories of him. I visited him in Michigan last year and I am proud to have known him. To the right is a photo of me at 17 which was taken by John. John Joseph Krawczyk Age 83, passed away October 17, 2006 in Lansing, Michigan. Born August 16, 1923 in Lansing to Adam and Maryanna (Kagan) Krawczyk. John attended school in Eaton Rapids through High School. 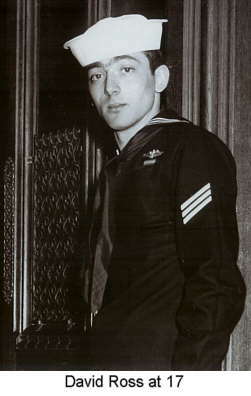 In January of 1941 John enlisted in the Navy. Early in his Navy career he served aboard the U.S.S. Tuscaloosa. In 1944 John went to submarine school, then he served aboard seven submarines as a fire control technician. In 1954 John was chosen to serve aboard the USS Nautilus, the first atomic submarine. He was one of the original crew members. He also served as their unofficial photographer. He was always seen with a camera hanging from his neck ready for that special shot. Many of his photos of the USS Nautilus and Crew members were published in newspapers, magazines and books. Among his shipmates he was known as "Mr. Nautilus". In his collections he has a vast number of published articles of the history being made by the USS Nautilus and Crew. John was the last of the original crew to retire, retiring as a Senior Chief Petty Officer in 1965. During his career he received numerous decorations including many citations from the Secretary of Navy, Admiral Rickover and Gerald Ford of Michigan. During and after serving in the Navy John went on to college in California majoring in photography. He worked in Commercial and Advertising studios before retiring. John was preceded in death by his father, Adam Krawczyk; mother, Maryanna; 1 brother, Joseph Henry; and 3 sisters, Mrs. Wanda Eberwein, Mrs. Dolores Caine and Mrs. Anne Baker. John is survived by 4 brothers, William Sr. (Florence), Stanley (Barbara), Ted (Ida) and Adam; 2 sisters, Mary (Rhon) Pierce and Sophia Bradley; and many nieces and nephews. Funeral services will be held Monday, October 23, 11:00 a.m. at St. Mary's Church in Charlotte, Michigan. Visitation will be Sunday evening October 22 from 6-8 p.m. with the Rosary at 6:00 p.m. at the Skinner Funeral Home in Eaton Rapids. Graveside services with military honors will be at Arlington Cemetery in Washington D.C. In lieu of flowers memorials may be directed to the Nautilus Memorial Submarine Force Library and Museum or The Nautilus Alumni Association in Memory of John Joseph Krawczyk. For online condolences go to www.skinnerfuneralhome.com. Below is a photo of me, John and Jamie Deuel taken at the 2004 reunion in Groton. And then, some starless night, the cable slips, Leaving an eddy at the mooring place . . . Gulls, veer no longer. Sailor, rest your oar. No tangled wreckage will be washed ashore. Farewell shipmate as you report for duty on eternal patrol. John Krawczyk was my mentor and dear friend who I lost touch with in 2001. He taught me everything about photography and had patience that is why for the last 25 years I've been a photographer. 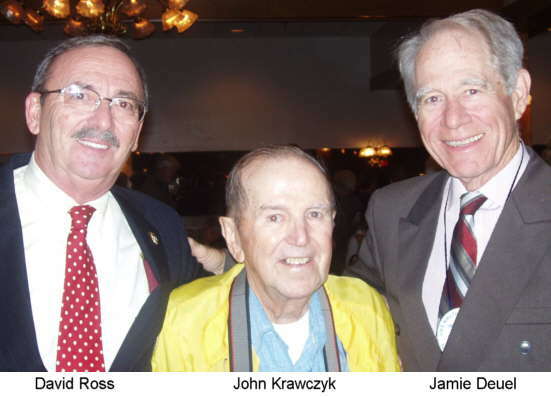 I spent a lot of time with him during his photography years and have wonderful "John Krawczyk" stories. Also, went to visit with him in Las Cruces and can say, John, marched to his own rhythm, was very talented, a totally giving person. I could go on writing about John however, I just received the news and my sadness is overwhelming but wanted to get some positive words out about John. He even took me to one of the anniversaries of the Nautilus which was a lifetime highlight experience as he toured me through the submarine. Also, got wonderful John stories from his shipmates. My prayers for his peaceful final resting place are with John. There was only one John Krawczyk and everyone loved him. Rest in peace my dear friend ... I've missed you but will cherish the memories.